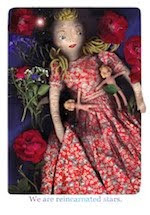 William Morris Fan Club: SS United States -- Saved from the Scrapyard!!! 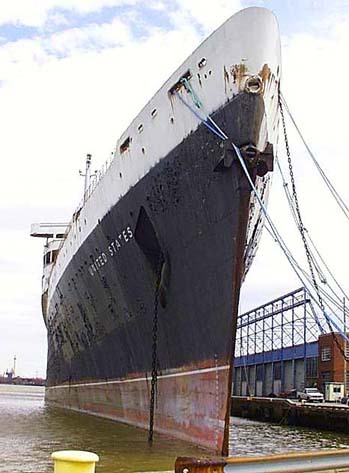 SS United States -- Saved from the Scrapyard!!! 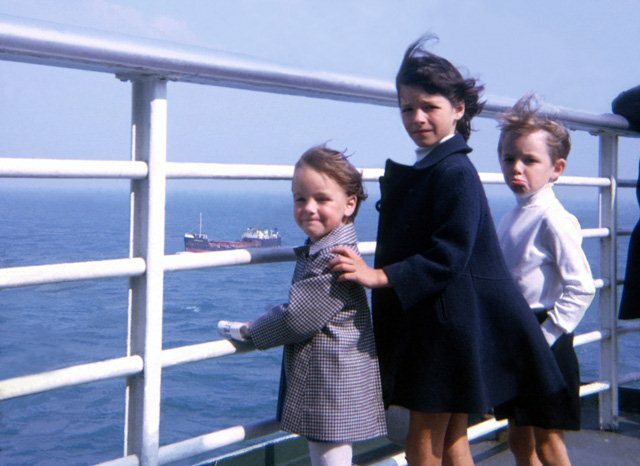 This is me and my sibs sailing to Europe in 1968 on the fastest ocean liner of all time, the SS United States. 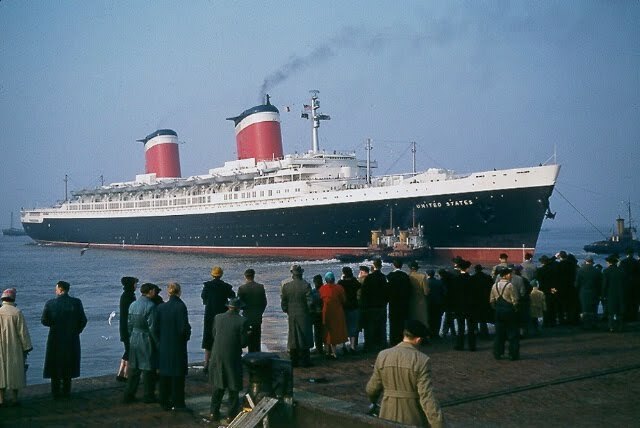 The SS United States was a luxury passenger liner built in 1952 both to capture the trans-Atlantic speed record for the U.S. (which it did on her maiden voyage) and to serve as an easily convertible troop carrier if war broke out with Russia (Cold War). 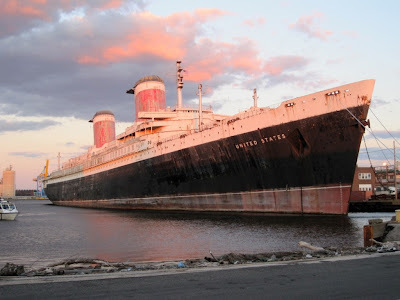 The SS United States operated continuously in trans-Atlantic passenger service until 1969 when she went to the shipyard for overhaul and never returned to service. Airline travel had become cheaper and faster. Returning from Europe in the summer of 1969, we were among the last passengers ever to sail on this beauty. Since 1996, the SS United States has been docked at Pier 82 on the Delaware River in Philadelphia and just this past March narrowly escaped the scrapyard, due primarily to the more than twenty year effort of the SS United States Conservancy. This national nonprofit organization has fought to preserve America’s national and legendary flagship while advocating for a dignified future for this historic ship. A few days ago they announced the exciting news that Philadelphia philanthropist H.F. (Gerry) Lenfest has pledged up to $5.8 million to the Conservancy, funds that "will be used to purchase the vessel from its current owner, Norwegian Cruise Line/Genting Hong Kong and maintain the ship in its current berth for up to 20 months while redevelopment plans are solidified." On her maiden voyage, the SS United States broke the record for fastest trans-Atlantic crossing by a passenger liner, capturing the "Blue Riband", going from New York Harbor to Cornwall, UK, in 3 days, 10 hours, 40 minutes at an average speed of 35.59 knots (40.96 mph; our trip took five days). On her return voyage she broke the west-bound record, a speed record she still holds. 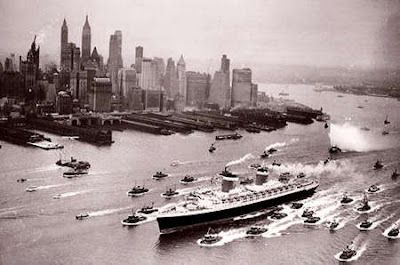 "She is widely considered the greatest ocean liner ever built. She was also a secret weapon during the Cold War, able to be converted to a troop ship capable of carrying an army division 10,000 miles without refueling or replenishment. The ship became an icon of her era, transporting four American presidents and other heads of state, military and business leaders, and countless celebrities. She also brought many immigrants to America." I can still remember vividly my trips on the liner---the movies, the bingo games, the pool, the fancy dinner tables, everybody getting sea-sick as we skirted a huge storm, walking up and down the gangplanks, arriving in Le Harve and New York, peering into the first class sections of the ship! When I get on a plane for Europe later today, with the cramped seats and unappetizing food, I will think back with nostalgia on my first European adventure, happy knowing I might get another chance to walk around this great ship someday soon! My first in situ Banksy!